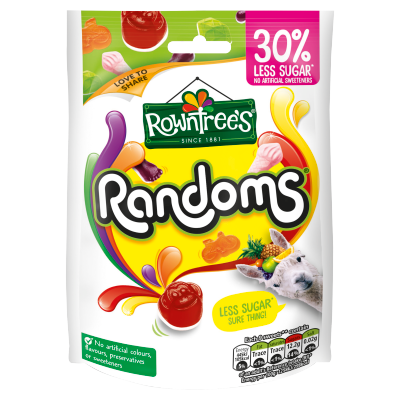 Rated 5 out of 5 by Gummy lover from Reduced sugar Ransoms are BETTER than full sugar I prefer the taste of the reduced sugar Randoms. Well done. Rated 3 out of 5 by Swansea lad from What happened to liquid filled ones :( Used to be my favourite sweetie, but when did they do away with the liquid filled centre ones, they were my fave! Had a big box of random for christmas but none in there. Still good but no longer the best. Rated 4 out of 5 by Icecream from Love them BUT My fav chewy sweets brilliant texture and amazing flavour BUT fifteen soft foamies in one pack??? Dissappointed. Last pack had 12. Rated 5 out of 5 by beto ragazzini from foamy sweet and liquid-filled i just going to say PERFECT, please you have to sell this ones in a big bag, i love it. Rated 5 out of 5 by Thomo22 from Big fan I love Randoms. My favourites are the cream and pink ones. I’m filled with disappointment as the large bag I just had only contained one of these. Please please please please be less random and put more pink sweets in each packet, or better still do a bag with just pink ones. 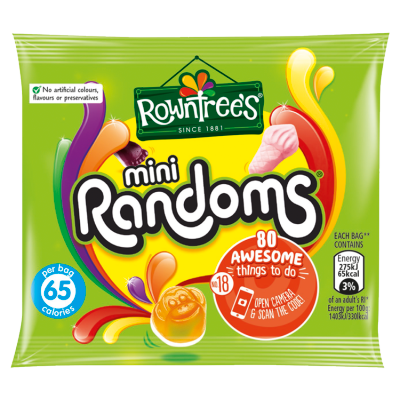 Rated 2 out of 5 by CC22 from Great initiative but disappointing mix I have recently tried a few packs of the Rowntrees Randoms with 30% less sugar. I think it's a great initiative and the taste hasn't been compromised at all, they still taste delicious! However, in multiple packs that I have bought, I never find any of the ice-cream / foam sweets. These are the best of the mix but very disappointed that these haven't made an appearance at all :( Please can there be more of these added? Was very sad that out of multiple packs bought, I only came across one or two in total - a couple didn't have any. Rated 4 out of 5 by Goat Girl from What happened to the marshmallow icecreams? I love Randoms. They are really fruity and tasty and my favourite ones are the marshmallow ice creams. I was really disappointed today when I bought a large bag from Sainsburys petrol station and it didn't contain a single marshmallow! 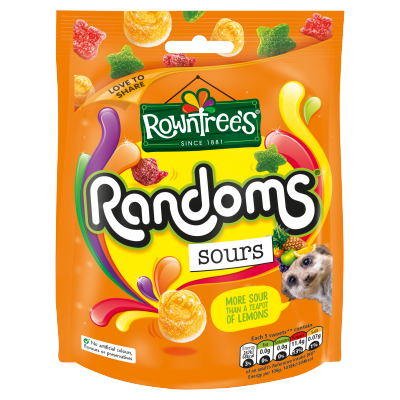 Have Rowntrees stopped putting these into Randoms? I hope not! 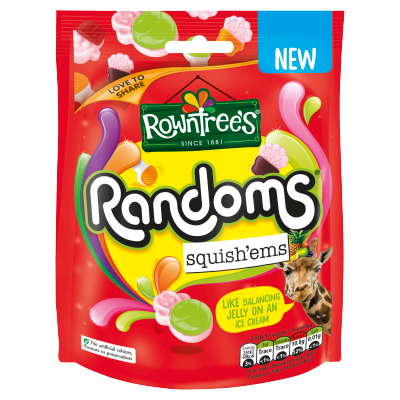 Rated 4 out of 5 by Chennelle Lawrence from More Mellows I absolutely love Roundtree Randoms, I just wish they had more of the squidgy Marsh-mellow ones. Its me and my boyfriend's favorite and we are always fighting over the 5 or 6 that are in the packets. Maybe make a Marsh-mellow pack??? Rated 1 out of 5 by Anon from Very disappointed Two issues. The first issue is that your ingredients list on the bag only states 'gelatine' not that it has either pork, beef or vegetable based gelatine. Secondly, after buying a bag to take it home and research found out that as a vegeterian I couldn't even taste them because it is in fact pork gelatine used. So there is a full unopened bag of these currently sat in the bin outside of my house. Rated 5 out of 5 by Cyder Simon from Lovely sweeties. 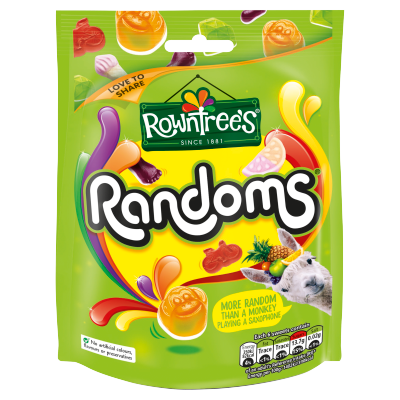 I simply can't eat enough Randoms i eat more than seven bags a week. Rated 5 out of 5 by Trudie lewin from Mouth watering sweetness Like a little lucky dip surprise bag full of flavour packed gems. Excitement and delight rolled into one. Rated 5 out of 5 by Anonymous from so juicy Dear rowntrees My name is rylan, I am 5. Me and my little sister jasmine just love rowntrees randoms. 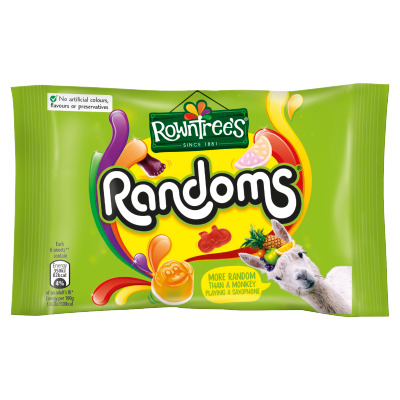 There's nothing like a rowntrees random, were so glad we found em'! Thanks for making them, they make us smile. Rylan Mummy sent this review in for me. She's over 18! Rated 5 out of 5 by Anonymous from Tasty Got some for my granddaughters. I nicked and bag oh wow!! Best sweets I've ever tasted. Favourites are the red and yellow with jelly in side. Wish you could do bags of those two. Rated 1 out of 5 by Casey from Disappointed Normally I would say that I am a huge randoms fan, however, i recently bought large share bag of these and there were no marshmallow sweets inside. The marshmallow sweets are the main reason I buy randoms so as you can imagine I was highly upset with the pack I received. Rated 5 out of 5 by G anton from Great sweets What's with the joke on the packet? Nice sweets though not worth 60p though. Rated 1 out of 5 by Anonymous from As good as ever. For a change i brought me and the grandkids and was very pleasantly surprised.